Heart rate sensing headphones aren't a new concept, but the Bose SoundSport Pulse is something of a watershed moment for the category. Until now, we've seen offerings from tech brands, with the Jabra Sport Pulse and Bragi Dash impressing in our tests. But Bose is the first big audio player to make a noise in the biometric headphone space. Increasingly, heart rate reading headphones are making sense. The lack of music-enabled running watches and proliferation of free apps for working out mean that most people are still training with their smartphone strapped to their body. While for many that's unthinkable, it's cheaper and easier for some runners, plus you get added benefits of easily accessible music and peace of mind, especially for female runners. But phones won't track your heart rate, so you may be missing out on the benefits of heart rate workouts, which as we've discovered, can be a big part of your training regime. Heart rate sensing headphones plug that gap, and thanks to the ear's suitability for reading a pulse, the tech can actually drive higher accuracy than wrist-based devices. But can Bose – a newcomer to connected sports tech – nail the finer details of sports tracking? We put the SoundSport Pulse through its paces to find out. We'll not beat about the bush: the Bose SoundSport Pulse is about 30% too big for a pair of sports headphones. Sure, there's a lot of tech to pack in, but as soon as you open the box, you're immediately struck by how ungainly they are. 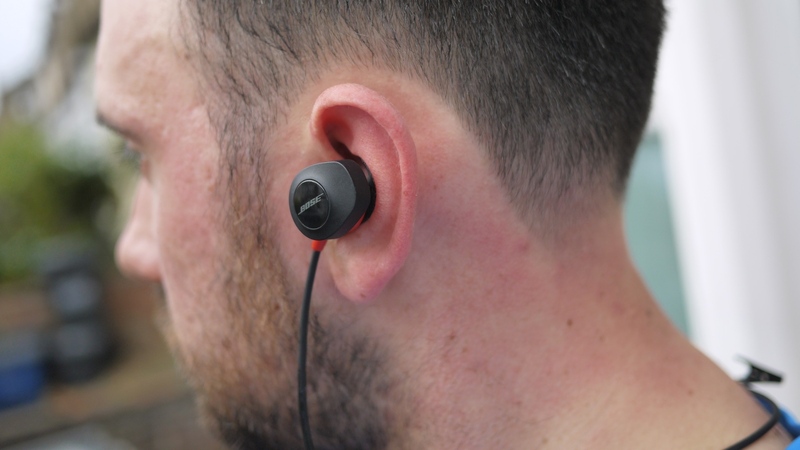 The buds themselves are a normal size, with squishy rubber moulds that slide into the ear, and form a seal for noise cancellation and a tight fit. You get a range of different sizes buds in the box, which can be changed in and out. But it's the body of the buds that's enormous. They're super thick, sticking out of your ears like Frankenstein's bonce bolts, and, unsurprisingly, aren't particularly comfy. It's a hindrance in terms of usage, too. During longer workouts, the natural lubricant of sweat combines with the heavy bud's natural gravitational pull, meaning they need regular readjustment. And that's not just for comfort's sake: the longer we worked out, the more we'd hear "re-adjust left earbud" barked into our ear, as the sensor lost contact with the skin. Certainly, the Jabra Pulse is a much more comfortable and less unwieldy fit than the Bose, and perhaps better suited to running. In terms of features, we weren't surprised by a plethora of modes, as we were during our testing of the Jabra. You get music and heart rate sensing – nothing more and nothing less. By way of comparison, the Jabra Pulse tracks cadence via a built-in accelerometer, and has an impressive partner app which offers multisport modes and guided workouts – there's nothing of that ilk here. While you will need to download the Bose app, once paired the headphones will appear as an external sensor, which should be usable by your preferred workout app. We used it with Strava and it was a seamless experience. The only other feature to mention is the in-line controls and microphone, placed below the right ear. It means you can take calls on the headset, pause music, adjust volume and speak hands free, and triple tap to skip music forward/backwards. Given the way that the Bose SoundSport Pulse is designed to work with your existing apps, there's little to do here other than study its accuracy. Bose has opted to use Valencell's sensor tech, so it comes from good stock. In fact, it's the same optical sensor as the Jabra Sport Pulse, so the two shouldn't be too far apart in terms of accuracy. Well, the Bose offered impressive accuracy across against a chest strap. Its average heart rate reading across a five-mile run matched a chest strap to 2bpm, and more impressively, recorded the same peak of 190bpm during some short sprints. On two other training runs, the Bose SoundSport Pulse was again within 5bpm of our preferred running watch the TomTom Spark 3. However, there were minor issues, and in one run the SoundSport Pulse took around five minutes to get going. Over a series of runs across our time with the Bose SoundSport Pulse, the majority performed to expectation. However, data outages weren't an issue in our testing of the Jabra Sport Pulse, so while the tech is the same, it looks like Bose's algorithms might not be quite as robust. We're sure that over-the-air software updates (we downloaded one that took 25 minutes to install) will fix these minor issues, but those looking for the most reliable data should bear that in mind. Bose (top) and Garmin chest strap (bottom). Notice the sensitivity of the ear based tracker when stopping to tie my shoe after two miles. Providing block-rocking sound quality is firmly in Bose's comfort zone and thankfully, the SoundSport Pulse doesn't disappoint. It's hands-down the best audio we've experienced from a set of biometric headphones. That perhaps explains away the size of the buds. With impressive bass and mid-range detail, you can easily use these on the commute as well as when working out. What's more, we were seriously impressed with the battery life. The SoundSport Pulse gave around six hours of music playback and we were able to get enough juice into them to run with about 15 minutes of charge, via the Micro USB port. That's a serious improvement over the Jabra Sport Pulse, which continually seems to be out of battery. With best-in class sounds and impressive heart rate accuracy, the Bose SoundSport Pulse is a decent option for those looking to get serious about training. While the bulky design is a significant downside and we did suffer a couple of outages while training, problems were slight, and perhaps offset by the impressive battery life and booming sound quality.